Do you type in long replies for same customer questions, every time? Create canned responses/pre-defined templates, add it to ongoing chats and save a lot of time. Create unlimited canned responses on all plans. Canned responses can also be created for each widget profile. How to create a canned response? 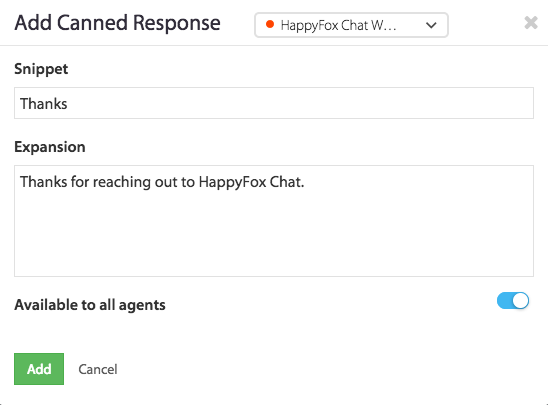 a. Click on the "+" icon on HappyFox Chat admin panel >> choose "Add a canned response". b. Go to Automate section >> Click on the "+ Add" in 'Canned Response' section. the add "Expansion(/description)" that is to be added as a canned response. On the right top corner you can choose the widget profile. You can also choose whether the canned response can be made available to all the agents, or only to the admin users. Once done, click on "Add" button. 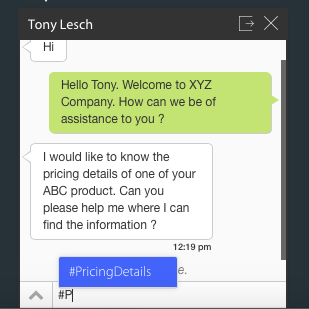 How to add a canned response during chat? Type # key in the chat area, followed by the snippet's name or you can choose from the list and click "Enter". How to delete a canned response? Hover over the canned response that you want to delete >> Click on the 'Delete' icon on the bottom right >> Confirm delete.